Take a journey into your soul at the serene and offbeat holiday home – Birdsong & Beyond. 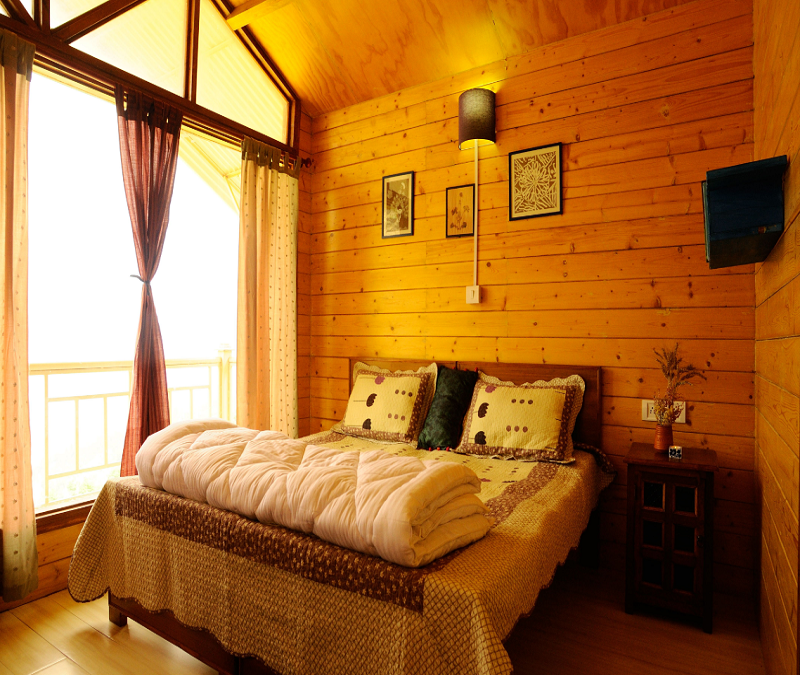 Located on a mountain ridge in a hamlet in district Chamoli of Uttarakhand, almost equidistant from the ranges of Kedarnath and Badrinath, and a little too away from the popular trekking, pilgrim and rafting routes of the area, this charming homestay is the perfect combination of rustic living with modern luxuries. The pinewood cottage with its full-length glass picture windows and cosy decor makes for an ideal rural retreat for travellers seeking to reconnect with themselves and nature. This is truly a vacation spot far from the maddening crowd, in the heart of a village. 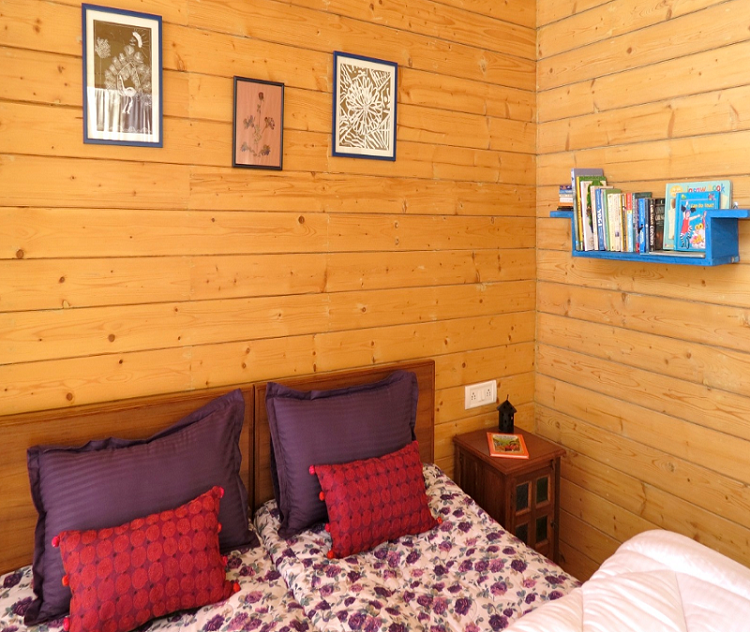 The homestay offers homely comfort, soothing quiet, and a sense of time slowing down, in tandem with the rhythms of nature and a rustic lifestyle. For further delighting the senses, there is savoury local cuisine, often cooked with ingredients grown at the property or procured from local farmers, besides regular home-cooked meals. By the Alaknanda River: This River is one of the two headstreams of the holy Ganges. The Alaknanda River is best known for globally renowned river rafting spots. The Alaknanda River is dotted with pilgrimage sites all along its banks, like the Holy town of Badrinath. 30 kms downhill from Birdsong. Hike to Kartik Swami Temple: This Temple is dedicated to the eldest son of Lord Shiva and is at an altitude of 3050 metres above sea level, offering a panoramic view of the majestic peaks of the Himalayas. The Temple houses a naturally carved idol of Kartik Swami, and is the only temple dedicated to the deity in Northern India. The temple is famous for its trek route through a dense forest, which is home to diverse flora and fauna. Drive 20 mts from Birdsong to start the hike. Hike takes about 2 hours. Visit Ancient Temples:Guests can explore places like the Valli Village Temple and the Dukhtamba Devi Temple, which are about an hour’s mild trek from the property. Connect with Nature:Guests can visit the Mohankhal and Nagnath protected forest ranges to take guided walks in pristine jungles and get an insight into the lives of hard working and resilient rangers who keep our forests and wildlife protected. Wildlife sightings of some species are almost guaranteed. The property has 4 rooms, spread over two floors. Each room has a cosy and inviting appeal. The decor is basic yet aesthetically pleasing. 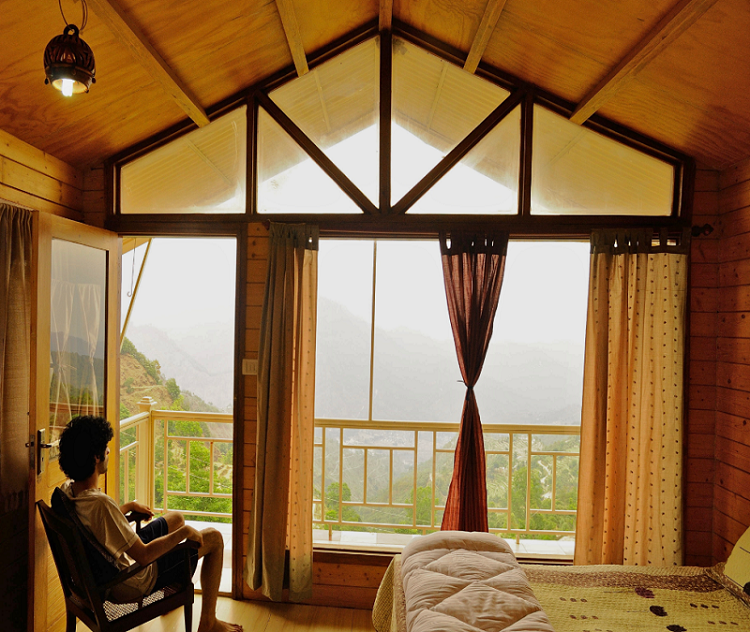 There are glimpses of the owner’s personal touch like the thoughtfully placed bookshelves, and the large picture windows which are the highlight of the rooms, offering exquisite views of the Himalayas and the valley below. The rooms are designed with all modern comforts yet retain their rustic hill cottage charm. The bathrooms are clean and well maintained. Guests travelling by car/SUV can drive to Guniyala Khal Village directly. Guests can inform us beforehand so that we may guide you as you arrive here. Guests travelling by bus can catch a bus to Pokhari, which is a short 2 kilometres away from the cottage. Guests can inform us beforehand so that we may guide you as you arrive here. Getting There Delhi - Rookree - Rishikesh - Devaprayag - Rudraprayag - Chopta - Pogatha - Mohankhal - Bamanthala - Kimkholi - Birdsong We recommend stopping at Grand Cheetal for your first pitstop then Rishikesh or Shivpuri for a night halt to truly enjoy the hills. Rishikesh is around 6 and a half hours drive away from the property. The room is located in the Auxiliary Cottage. It has a double bed and an attached bathroom. The room is located in the Auxiliary Cottage. It has a single bed with an attached bath. Family Cottage has 2 double rooms on the ground floor, with a common bath. One double room is on the first floor, with an attached bath and a balcony.